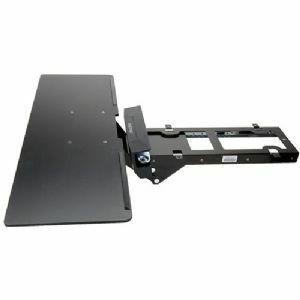 The Ergotron Neo-Flex Underdesk Keyboard Arm provides a full range of adjustment to accommodate a wide range of computer users. Match this accessory with a monitor stand or arm for a complete ergonomic desktop solution which serves as a necessity in any word-processing office. It stores the keyboard conveniently under the worksurface equipped with ball-bearing slides producing a smooth motion giving you an optimum comfort. It includes an arm, one-piece tray, desk clamp, slide mechanism, and a mounting hardware. It also has a signal knob adjustment for both height and tilt settings. Buy the Ergotron Neo-Flex Underdesk Keyboard Arm today!